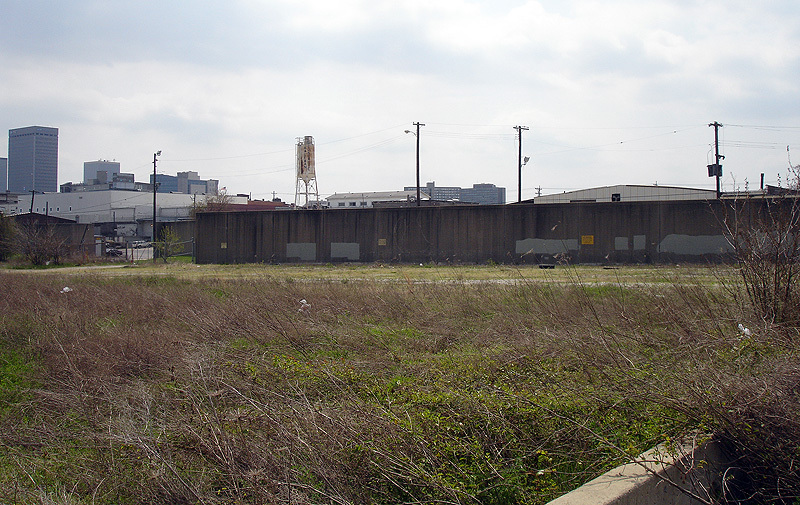 Directly west of Downtown Louisville, acres of land in the Shippingport neighborhood sit barren and unused, trapped between a floodwall and an expressway. You can access the land from the levee trail that runs along the riverfront and Portland Canal, but most never venture into the sea of weeds and rubble. You can still make out the old street pattern of cobblestone and yellow bricks. In some places, there are still sidewalks and steel rails, a reminder that long ago, the area roughly stretching from 9th Street to the 14th Street elevated rail line was industrial and housed many rail yards. That’s fitting to the history of Shippingport as a center of industrial and commercial trade and movement along the canal and Falls of the Ohio. Many years ago, the area was abandoned and sits empty still to this day. 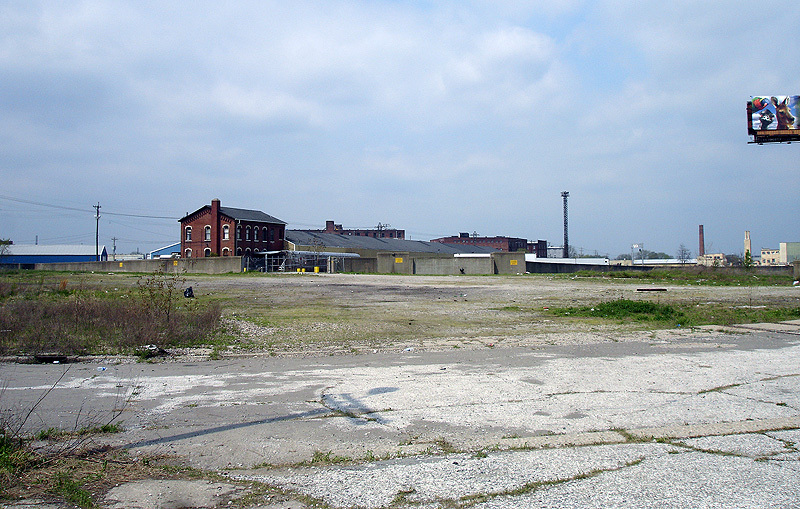 When you look around the swath of open space, easily walkable from Downtown Louisville, it’s easy to be amazed at how the waterfront land directly adjacent to the heart of the city is utterly forgotten. As many have pointed out, movement along the river has defined Louisville’s early growth, especially in this area. Before the Portland Canal was built, boats were unloaded in Shippingport and freighted to Portland below the falls. After the opening of the canal, the area remained strong with industry and warehousing. This movement of goods helped Louisville and especially the area around the Falls grow. Some have claimed recently that the elevated Interstate fulfills this historical function of movement along the Ohio River in a modern way. It’s simply not true. How are the neighborhoods here benefiting from the highway when they look like this? At most, you can look up and see the trade and commerce passing you by. Now, the highway’s exit structure provides only two links to the area at 22nd and 9th Streets. Replacing the elevated road with an urban boulevard would change this predicament as locals travelling on a local street will be directly linked with the neighborhood. A boulevard would provide connections at more frequent intervals. Good for congestion and for the neighborhood. It’s a long way off, but not out of reach. There’s enormous potential in Shippingport that could help to expand our Downtown’s western boundaries and create a vibrant canal-front neighborhood. There are issues to be dealt, of course, with such as the flood plain, but there is no shortage of creative solutions that could make it work. We must first resolve to fix our urban transportation problems in a responsible way and the possibilities will unfold in time. Just imagine what Shippingport could be for the city. if you squint, you can see the original permanent settlement that became louisville. well, not really, but clark's fort was right there, 12th-ish, north of main. thanks, branden. so much could happen here. i’ve been back here and it’s one of the coolest areas in louisville, with great views. there was talk several years back of building a “western” waterfront park as part of the waterfront authority’s plan, which i really hope they still do at some point. but the area seems poised for a great institution, like a college or campus of some sort. it’s sort of isolated and off the beaten path and i think someday whatever its use it will be a great neighborhood. there are also some great warehouses that could host lofts for residents and artists . . . Thanks for that link archintent. I’m preparing a post with photos from the 21c unveiling that should go up this weekend. Per the note about the fort, if you walk down Rowan Street by the floodwall just east of 12th I believe, there’s a concrete stump on the sidewalk that once housed a decorative urn commemorating the fort and used by horses for water. It’s long gone now. amazing things have happened down in this zone in the past and you’re right that it DOES have great potential. the biggest issue is that the floodwall was routed so far south that this area is largely outside. that hasn’t stopped waterfront park, parts of butchertown, the ali museum, slugger field, etc, but it IS a challenge. the west waterfront park referenced above first appeared (to my knowledge) on the downtown development plans, accompanied by a sketch prepared by edaw. both my master’s project and the recent uk studio embedded a west park as a sort of assumption. ddc under barry alberts was working on the extension of river road (even pre-museum plaza plans) to connect through here to portland, but i think there were some complications in routing through the i64 piers. don’t know where that stands now. if you’re fascinated by infrastructure and transport, the history of this place is amazing. from the original portage settlement through its freight and passenger rail history, the construction of the canal, its connection to the network of streetcars, the construction of the floodwall, and then the construction of 64, this place has seen it all. the old sanborn maps also make it clear the extent to which this was THE industrial hub of the city before industrial activity moved farther out. industry, residential neighborhood, neighborhood services: it was all mixed together in one rough and tumble zone. on top of it all, a traveling circus used to winter here. As much as it pains me to say it, unless something dramatic happens, 8664 is dead. (I hate it — wish it wasn't so — but the powerful have had their way.) So, the question for this and so many other spaces in Louisville becomes: Now What? Frankly, I had no idea that there was a parcel of land of this size within a few blocks of downtown. If River Road could be extended, we could indeed repurpose this area. Does anyone know more about that possibility? I'm going to do a note about this on my site. Thanks for the story! Why "build in" with housing and commerce in such areas when we can spend half a trillion dollars on two new bridges, a mile or so of tunnel under some mansions, and a few thousand square feet of new interstate passing over the great lawn, all to enable suburban commuters to flee farther out into farmland and woodlands, burning up lots more Arabian petroleum in the process? Any idea of a street-level boulevard and development of this area seems so silly in comparison to what our Mayor and Council members have planned. Don't be so sure that 8664 is dead. Even toll financing might not be enough to rescue the bridges deal, at least not at a politically viable rate. It has been all over the news how the consortium who leased in the Indiana Toll Road has lost their shirt. With tight credit and stretched bank balance sheets, it is going to be difficult to raise large amounts of financing on favorable terms in the near term, I think. That might not make 8664 happen, but funding is the Achilles heel of the ORBP. yeah. this land is literally “opened up to the water” right now. would need some Dutch-style flood remediation and pillar-architecture. Urbanophile’s point that the 8664 plan isn’t dead is a good one. There are still many opportunities to get the project on the right track. There’s no need to give up hope. Per Patrick’s note that the land shown in Shippingport is in the floodplain, it’s important to realize that there are solutions to make it usable that can easily be implemented if land values would increase. Certainly some of it would be a park which could handle some flooding, and other parts could handle development. It’s just a matter of allowing the potential of the land to increase and eventually the market will make it valuable. In some places, too, the floodwall isn’t very tall meaning the land currently is only susceptible to very heavy flooding. Consider how parts of Waterfront Park were designed on higher ground to act as a sort of levee in its own right. Why can’t a street-level boulevard be built under the interstate? Does the continuation of Waterfront Park involve this area?